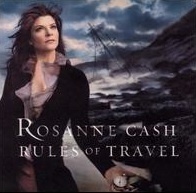 September When It Comes by Rosanne Cash and John Leventhal on the 2003 Capitol Records album Rules of Travel featuring the singer's father Johnny Cash in his last recording before his death on September 12, 2003. You Tube Bootleg with photo montage tribute "song about mortality and family." "I was born in September many years ago, my father died in September 2015. A very special song with much meaning for me!" "Both of my grandpas died the same September that Johnny Cash did. This song means a lot to me. It's been almost eleven years and I still can't listen to it all the way through without tearing up a bit. It's strange, and also beautiful, how much of an impact one song can really have on someone." "My mother passed away in September, two years ago. This song is very special to me.